By learning how to do a proper blowout at home, you can have your hair looking fresh from the salon any day of the week. Just knowing this basic hair styling technique can really make a difference in the volume, texture, and movement of your hair. 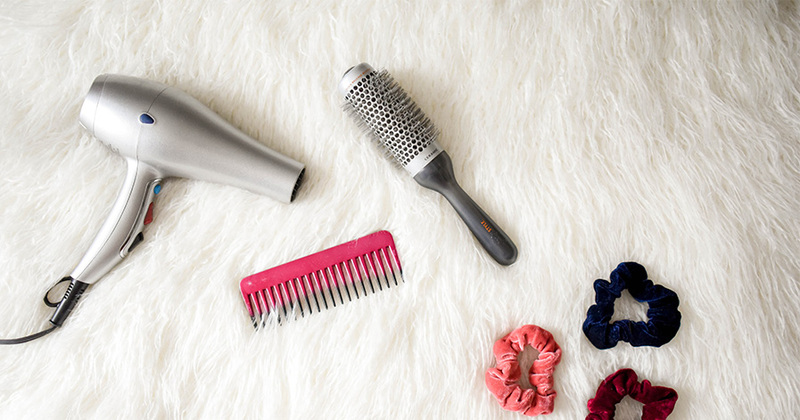 It only takes a few of the right tools and some practice before you can give yourself (or your friends) a blowout. From start to finish you’ll want to avoid frizz by not towel-drying your hair, using your fingers to gently move hair around, and by pointing your blow-dryer downwards. Once finished you can preserve your blowout, by sleeping on a silk or satin pillowcase that reduces frizz causing friction. The goal of a blowout is to create volume and movement, so you don’t want to weigh your hair done with too much product. Volume-boosting serum or hair spray might seem like a good idea, but just leave those products for another day. Once your hair is wet, simply comb through the strands with a nickel-sized amount of some heat spray. Unless you have rather thick and coarse hair, you’ll want to keep your heat setting on medium. It is also recommended that you get a nozzle attachment or a blow dryer that comes with one to keep distance between your hair and the heat. Use your fingers to tousle strands around while you begin the first stage of the drying process. The crown is the most important area to focus on, so you’ll want to start there while you still have all your arm strength. You’ll need a mixed bristle round brush and start on smaller section of 3-4 inches. This is when those alligator clips come in handy for to section hair into separate pieces. Once you have made your way through all your hair sections you should have delightfully soft and fluffy hair. You can add some shine spray to your hands and gentle rake it through your hair, but you won’t want to chance weighing parts of your hair down by spraying anything on directly.